Seaside Glass Villa is a unique accommodation and experience not only because of the villa’s special qualities but also due to the location. 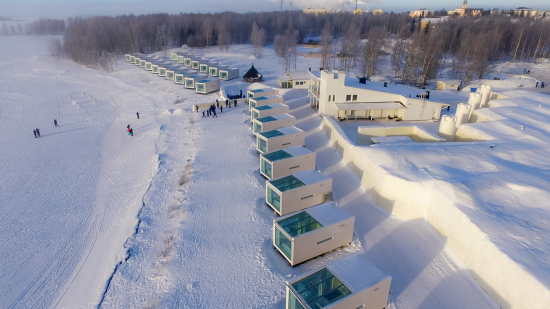 As opposed to all other hotels these villas are situated on the shores of the sea that freezes over during winter. There are not too many places in the world where the sea stays frozen half the year, and the ice-covered sea is within a walking distance from the city centre of Kemi, and a fun playground for both locals as the travellers. As an example the world´s only ice driving location on the frozen sea is in Kemi, Finnish Lapland. Villas are also situated in the SnowCastle area so in the winter, right next to villas, rises the world-renowned SnowCastle of Kemi, by now the 23rd time. The Castle is built solely of snow and ice and it is truly an art-work of snow and ice. The Castle consists of stunning snow and ice sculptures, a huge SnowRestaurant, SnowHotel and SnowChapel. Villas are a Finnish design and constructed nearby the City of Kemi. They are mainly made of glass, including the roof. 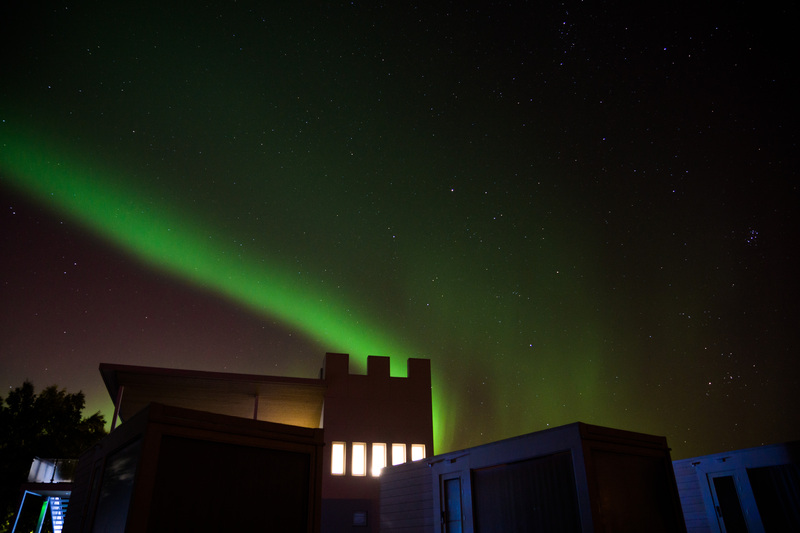 The guests can lie comfortable in the bed and observe the starry sky and the Northern lights through the roof. The other building material is Finnish quality log-wood timber. By the end of the year 2018 the all-year-round SnowCastle building will be opened in the area, where travellers from around the world can experience the adventure of snow and ice both in the winter as well as in the summer. There are no other places in the world where one can enjoy a delicious 3-course dinner by the ice table in the middle of summer! In addition to the all-year-round SnowRestaurant, the building will also include a warm restaurant as well as other various services of additional value to travellers. In addition to the Kemi SnowCastle the city has gained great recognition for its Icebreaker Cruises. By now for over thirty years the Icebreaker Sampo has provided unforgettable and unique icebreaking cruises for travellers from 60 different countries. 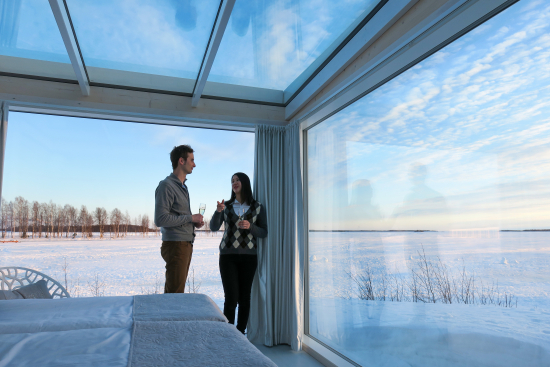 ”Customers staying over-night at the Villas visit of course both the SnowCastle and participate on the Sampo Cruises. The unique combination works well and has brought great praise from our customers. We aim to develop our operation benefiting from both the Lappish nature and the seaside location of Kemi year-round,” says Noora Barria of the Kemi Tourism Ltd. productions. “The villas have had great demand, and even the awards speak for the fact that travellers are looking for over-night stays of great adventure. The Kemi Seaside Glass Villa area will grow with additional five larger villas this winter”, Barria continues. The World Luxury Hotel Gala was celebrated the 11th time, this time in Switzerland in Europe. Quality hotels providing excellent service are awarded annually. The World Luxury Hotel Award is given in ten different categories of hotels providing quality services worldwide. The hotel is selected to the contest by customer suggestions. After the acceptance for the contest, the hotels are voted on the World Luxury Hotel web pages. More information on our web page www.visitkemi.fi.